The below is available at: Old Hippie’s Gift Shop. Sometimes you’re the bug — and sometimes the windshield. So far this year, I’ve been the bug. We left for the shop early Tuesday morning with the Texas Whale and Big Red Ram, and drove to a truck parking lot on the AR/MO state line. Wednesday morning we woke up to a flat on the stacker. We put on a spare and heading to a truck stop to fix the tire. It was found that the wheel actually had the leak — and so we’d be without a spare until we got back home. On the road an hour late, we finally arrived at the racer staging area at about 6PM — the 17th in line. Thursday we entered the pits at about 11AM, unloaded the cars, set up the pit, established credentials, and teched in the cars. When we returned we noticed the air bags on the street side of the trailer was flat. A look underneath found that the control valve was broke off. Fortunately I carry a spare so an hour later that problem was resolved. Dallas needed a new set of slicks on the Big Red Ram — and so we spent about four hours dealing with that as Mickey Thompson’s generator and air compressor was broken. Friday we were given two Time Trials in the morning and then two qualifying in the evening. 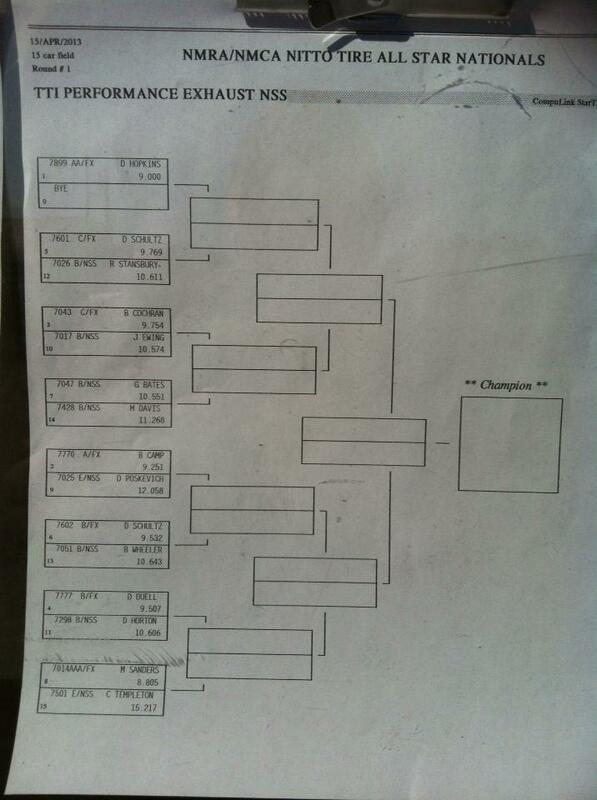 The third qualifying was scheduled for Saturday, as was the 1st round of Eliminations. Dallas’ car ran dead nuts on his 9.50 index all week end long. My car had a new bullet with 4 passes on it. It ran 9.65 off the trailer without weight on the first pass – which was what I was expecting. For the second Qualifying my Weather Station & Crew Chief Software said that based on the last run I’d run a 9.75 (my Index) if I bolted on 100 pounds. When I picked up the slip I was a 1/2 a 1/10 faster than expected and my 60′ was off 2 numbers. I guess I attributed that inconsistency to my rings starting to seat. For the first round of qualifying, I like to run a number slower (9.76) to get into the show — then I press it on the remaining qualifying runs. The computer said I needed to add 68 pounds to the empty weight box to hit that number. I was both disappointed and confused when the time slip said I ran a 9.78 — but that was only 2 numbers off and had me as the #7 of 21 racers in NSS. Later in the evening, the computer said that based on the 9.78 pass, I’d run a 9.752 with the same weight. I was shocked when the slip said 9.888 with a horrible 60′. The car felt good, wasn’t making any noises, and I good oil pressure — but the inconsistency was indicating a bad thing. In the morning we warmed up the car and ran the valves — and there wasn’t any issues there, so we checked the timing — dead on at 34 degrees. I guess I felt that I must have spun worst than I’d thought the night before. On the third qualifying run the car was lazy off the line affecting my RT and 60′ but was going down the track well. I had an opportunity to glance at the oil pressure at about the 1000′ and it was on the right area (too fast to look at exact number) of the gauge. Then between the MPH cone and the Finish line there was an explosion that about lifted the hood off the car and it felt like I had a front flat (the starter beating against the tire and control arm). When I saw that I still had control I flicked off the ignition and looked in my mirror to see a big cloud of smoke. I moved over to the wall and applied brakes when I was down to about 50mph (as my slicks were oiled up). I hopped out of the car and opened the hood (as I thought I had a fire) while a track member jumped the wall to slide a tray under the motor. Back at the line, many thought I’d wrecked because all they saw was flashing lights through the smoke, and my car against the wall when it started to clear. Track guys started bring me pieces on my aluminum block. I was put on a flat bed and taken to the pits. I picked up the above slip on the way back. In my pit, I found a hole big enough to put your fist through, with a piston-less rod. Dallas qualified well and was matched up with Mike Sanders in the first round of eliminations. 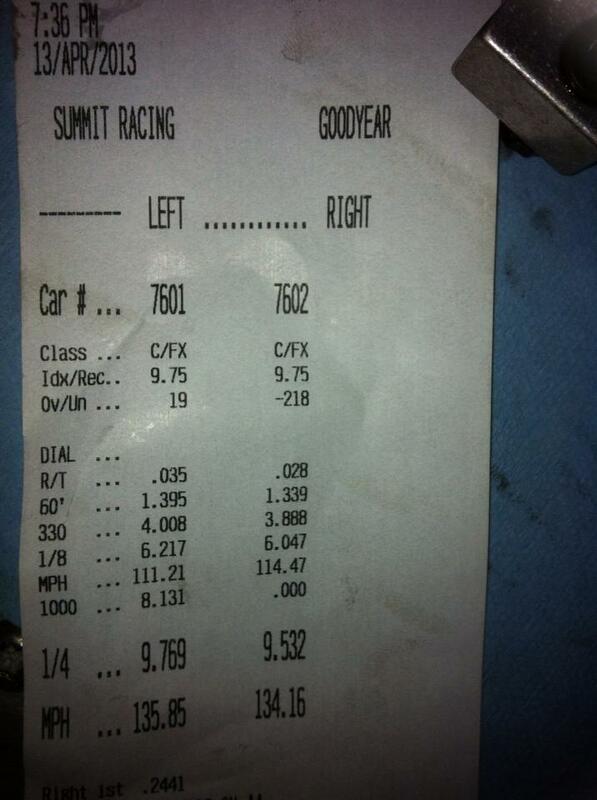 We had the car set up to run a 9.50 on the money — but Dallas broke out 2/1000 second too fast with a 9.498. We loaded up that night and got to bed at about 1AM. We were up at 5AM — but were blocked in until about 7AM. 1100 miles and 17 hours later and we pulled into the shop. Unloaded the cars and yanked the motor out. The bottom line is that there was a rod bolt or bearing failure and the engine is now a $25,000 paperweight, as is the transmission case. I’ll be in the Vitamin C for the next couple of races. While the Big Red Ram has been performing very well for Dallas, the Texas Whale sustained engine damage at our last race in Atlanta. We’ll never know the exact sequence of failures but the engine sustained a broken push rod, three bent push rods, a broken roller lifter, a pair of damaged roller rockers, and the three bolts on the geardrive to the camshaft loose. Despite the engine having but 11 passes on it since a cam and head change — the decision was to completely tear down for further cleaning, inspection, and bearing replacement. Dallas tore the engine down and cleaned the parts; I order a set of beefier push rods from Smith Brothers, rockers from T&D, lifters from Bullet, and timing set/gaskets/timing cover,engine bearings/cam button; and Damon has assembled the short block. However, we’re still waiting for the rockers and Cometic Head Gaskets — so the Texas Whale was not ready for this race. So the Vitamin C was pressed into action. I bought this slower (mid 10-second) car 4 years ago, and ran it for a couple of years while the Whale was getting finished — and Dallas was getting use to maintaining a mid 9-second car. A pin hole found it’s way through a cylinder wall two years ago — and the 426 block was just too worn to spend any more time as a race engine. A 440 block was machined and new dome-top pistons were attached to the old rods, crank, cam, heads, … for the new engine – and the car is scheduled to be completely rebuilt next year when my youngest daughter will start racing it in 2014. Since we hadn’t driven the car in two years or tested the new engine, we took it to San Antonio and I entered it in the bracket race – something I’ve never done. While I went a few rounds and made 5 passes, the car was running a very slow (but consistent) 11.3s. The day we left for the Mopars at the Motorplex — we made the call to change the distributor with one having advance. That appears to be a good call. We left the shop at 7PM on Friday night and arrived at the track at midnight. At 7 AM we started setting up the pits. I only had one chance to Time trial the Vitamin C, and it ran a 10.9 in horrible weather that had other cars 2 to 3 tenths off. I felt like I could get it to 10.7s or 8s with more timing — but since there was only 1 time trial — I had to leave it where it was. Dallas was able to get the Big Red Ram to run a 9.45 — which is about 2/10 slow, but still good enough to declare the B/FX index. Even with 30 pounds of weight I (7601) was too fast with a 10.98 for the first round of qualifying. Dallas (7602) spun and was a little too slow with a 9.58. For the second round I bolted in 50 pounds and ran a 11.03. Dallas was a little too fast. That had me as the #5 qualifier and Dallas #6 of the 13 racers. In my first round of eliminations, I ran Tony Smith, who is a tough draw. He’d beat me the first time we’ve run each other, but I have come out on the better end in the Semis last year at both the Mopars at the Plex and the NMCA race — both events I had won. I cut it way too close with a perfect light (.000) and a perfect ET (11.000) when I lifted at the MPH cone and let Tony take the stripe to breakout. Dallas had also won his first round. In the second Round I turned the stupid light on with a .009 red against Mark Buchanan, and he had a bad light and a poor run to add insult to injury. Dallas won his second round with a hole-shot win. I’m guessing I must have staged a little too deep. In the Semis Dallas again won with a hole shot against Frankenwagon — giving him a chance to avenge my loss against Mark Buchanan for the Finals. Dallas ran a near perfect 9.501 on his 9.50 Index — but was caught snoozing at the lights — handing the win to Mark Buchanan. We were shooting for Back(2012)-to-Back(2013) Schultz wins at the Mopars at the Plex — but Dallas still scored a $500 check for first worse. We were loaded up and passed through the track’s gate at 6:30PM, arriving home at 10:30 after driving through a bad storm. We’d like to thank our sponsors Royal Purple, Fuelab, TTI, Texas Motorcycle Excursions, Crew Chief Software, and Mancinni Racing for their help with our racing. Their sponsorships are very much appreciated – as are their products important for our success. The following is a recap of the most recent race that we send to our sponsors, and prospective sponsors. The second race in the NMCA’s Championship series is the NMCA/NMRA/NHRA combined race at Atlanta International Dragway, in Commerce, GA.
Dallas and I left the shop at 9AM (Central) on Wednesday and arrived at the track’s motorhome staging area 900 miles away at 2:30AM (Eastern) on Thursday. The trip was relatively uneventful other than driving through very high winds, which caused the 11′ corner trim on the stacker to come loose — having Dallas on the roof in 40MPH winds to cut it loose for me. We set up the pits (high winds — so there were no awnings or banners this week), established credentials, and took the cars to get teched in. While teching in we looked at the track, which was was yellow/green from a thick coating of pollen. 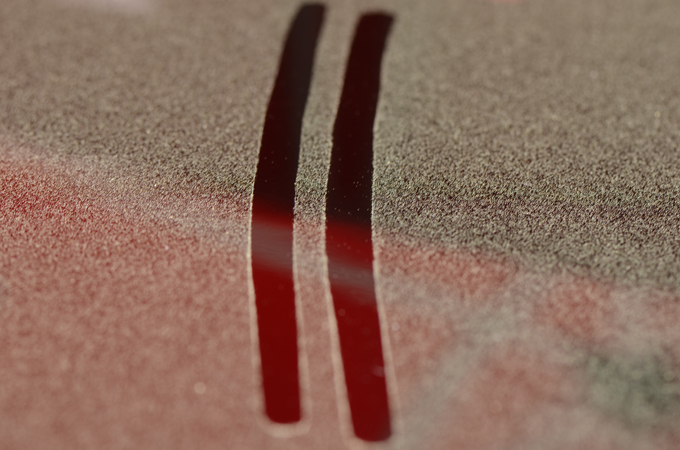 In fact we’d use a California duster on the cars three times a day for the whole weekend — and the below photos are about 4-5 hours worth of pollen on cars. It also was all over the inside of our trailer, in the tool box, in the motorhome, on the weather station computer — all over! A bad storm was due to hit Commerce Thursday night, and so we put everything up for the night. The storm had strong winds with driving rain during the night — rocking the coach pretty good. In the Morning we got the cars out and set up the pits again. Friday morning was off to a late start for the track. 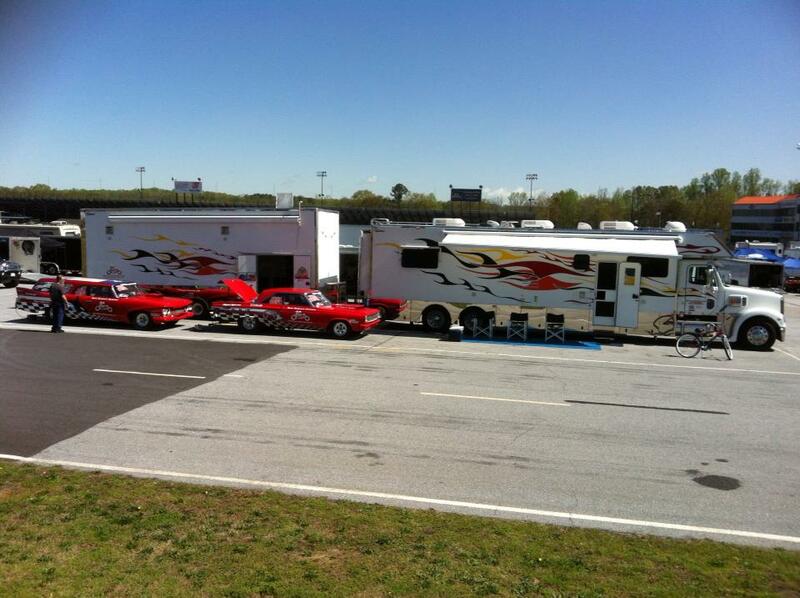 The Atlanta track crew has to be the worse at a NHRA track. They’re slow, arrogant, and inept — and they were about as bad this year as they’ve been in years past. Frankly I hate going to this track — and have the worse luck there. Time trials were suppose to be from noon to 3PM, but they called us to the lanes an hour late. We waited in the staging lanes for 2 hours before being able to make the first of the three passes we had hoped for. Dallas and I were able to be fast enough (for any extreme weather change during the weekend) when we made our base run. I (7601) wanted to run the C/FX (9.75) Index, and Dallas (7602) wanted to run B/FX (9.50 seconds), so we were in good shape. It was to be the only Time Trial we were to make as 84-year-old Willard Kinsler flipped his car at the 330′ cone — and it took hours to get that all squared away. The first Qualifying runs were to have been at 3PM — but wound up being at closer to 6PM. I always try to set my car to be 2/100 a second slower (9.77) than the index, so I can get in the show immediately — then use the next two qualifying passes to get closer to #1 Qualifying position. We do the same for Dallas’ car. Dallas and I ran each other in the 1st qualifying pass, the photo of which is the top photo. My car felt good, and the time slip with a 9.769 showed that I had my car right to within 1/1000 a second of the planned 9.77. Dallas was 32/1000 a second off his — which we consider good for a first round. It was good enough for me to be the #3 Qualifier and Dallas #5 out of 15 NSS cars. The saying is that your car always runs best before the engine blows — and as I was coming back from the pits the engine started to not sound right. 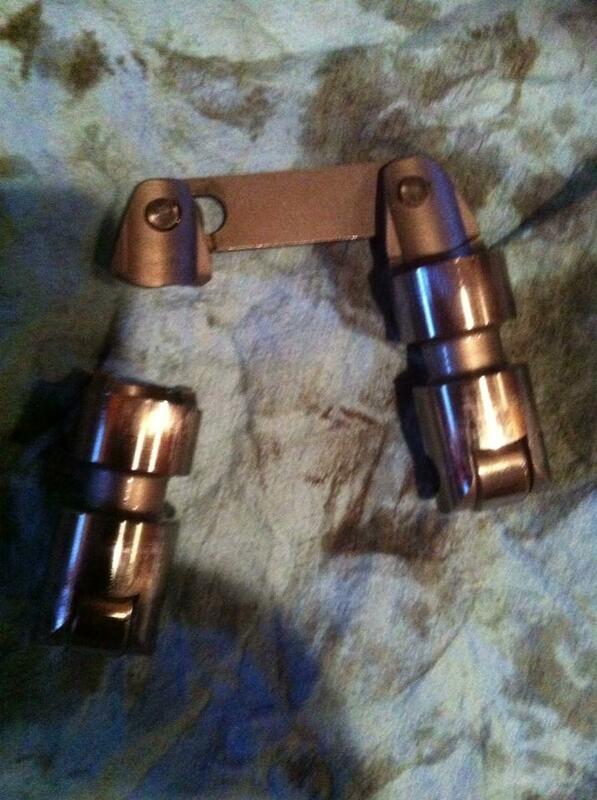 A quick look showed a broken lifter, a broken pushrod, two bent pushrods, and a pair of hosed rollers. We carry 11 tubs of parts — but not enough to fix this — plus I was certain we’d find more damage. So I was out, but at least I got qualifying points. After three qualifying passes — my single pass held up for a #5 Qualifier and I believe Dallas was #6. Dallas won his first round — but had a minor mechanical problem while moving into the burnout box — and so he lost his second round. The rain came after the second round — and so the Semis and Final will take place in Joliet this July. We left the track and 3PM Sunday and arrived home at 4AM Monday. My engine has since been torn down (other issues found), parts ordered and it will be ready for the Hot Rod Reunion in June. 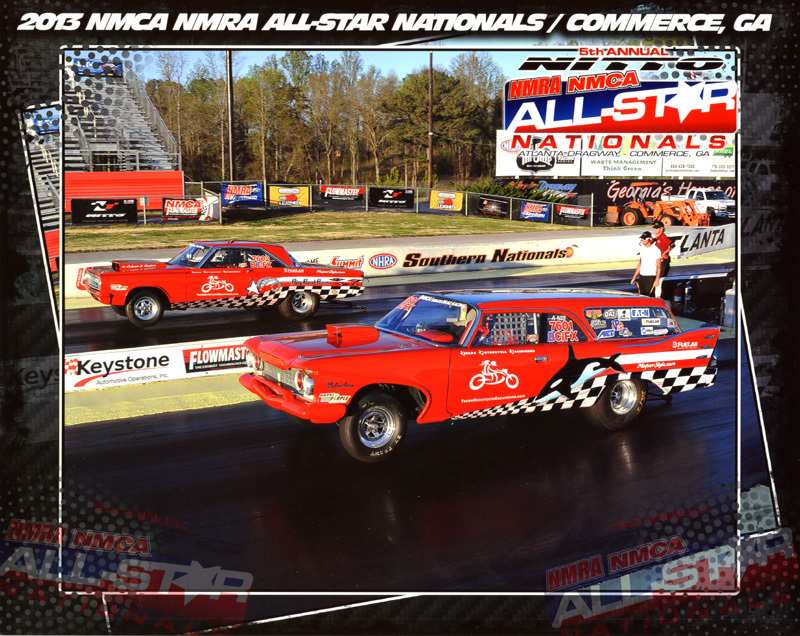 We have a pair of non-points races in Ennis and Memphis before then — that I will run in the back up car – Vitamin C.
Bradenton, Florida is the first NMCA six Point’s Races for 2013. Not only is it a long haul for us Texans — but for some reason weird stuff always happens when we go to this race. Last year it was the Generator of the coach going out as soon as we pulled in. In other year’s past we’ve had the rig stuck in the sandy pits; a blown engine, events held over to Monday, and one year a farmer was plowing at the top of the track in a 45mph headwind — creating dunes on the track. The Tampa area being the Tampa area — means daily rain. First a quick recap of 2012. Dallas was in the Top 10, and I was in the lead for the Championship going into the final Points (Double Points) race at Indy in October. I lost the Championship by one round, when I didn’t cut a good enough light against 00-Joe at 2AM. I did manage to win a NHRA Wally in Houston in November, and was chosen by fellow NMCA racers as “Ambassador of the Year” at the PRI convention in December. During the winter of 2011, we’d spent $50,000 making Big Red Ram ready for Dallas – so it was good to go for 2013 with very little work required. The winter of 2012 was time to make the Texas Whale right. It’s engine was pulled for the team’s spare and the Coronet’s previous engine was freshened and modified for the Whale. The car also received shocks all of the way around, a new converter, new custom headers, a gear change from 4.68 to 4.34. There were also some 4-link and other upgrades made. We never got a chance to T&T the car before the race — just make two light passes at a local track to ensure all of the changes held together. Wound up getting a front flat that couldn’t be repaired. New tires were ordered and mounted just before loading up for Bradenton. On Tuesday March 19th we loaded the rig with the cars, parts, and supplies to last a week away from home. Just as we were to knock off for the day a leak was discovered in the air tank that supplies the stacker’s air bags. Dallas got it slowed down to 1 pound a minute without air from the truck — but maintaining the proper air when the truck was running. There was no way to get a replacement tank quickly. We left at 6AM and were to meet our Pit Buddy Doug Duell at a Walmart in Lake City, Fl for the night; then we’d leave at 8AM to convoy the last 225 miles to Bradenton. However, while running at about 70 on I-10 in the Panhandle, I saw a cloud of black smoke explode in my right mirror and the trailer starting to jacknife to the right. I got her straighten and stopped on the the narrow right shoulder. I put new 6 new trailer tires on every other year at the cost of over $2500, and we always have 110 pounds in the tires before we leave home. So after consulting Google and making some phone calls, I found a tire service willing to come out and put my two spares on the trailer. Three hours and $250 lighter to Mountain Man’s twin brother, the spares were on the trailer, and a cheap (wrong size and wrong rating — but only available) spare was mounted on my 7th rim. We got to the Walmart at 1AM — and caught 5 hours sleep. In the morning all showered up and ready to go — we see that one of the tires on the other side had lost its entire tread. Fortunately there was a truck tire place fairly close by that had 6 new G-Rated 235/80-16 14-ply trailer tires of a different brand than Goodyear — who I’ve lost all patience with. Doug left for the track to get a decent pit for both rigs and we headed to the tire dealer. As we got back on the road — Doug called to say that I-75 was at a standstill because of a truck fire. So we plot a scenic route, which is always interesting for a 82′ rig, and head to the track the long way. We get to the track at 2; had the pit set up, established credentials and teched the cars by 4; and headed to the lanes before they closed them at 5.
quick pit set up then head to the lanes for a TT before they Closed. First pass had a perfect light. First pass off the trailer I cut a .000 light and ran the fastest pass that car had ever made. I made three TT passes with a .000 light, -.002 light, and .011 light. I wanted to run the 9.50 Index, but the wind was picking up to where we had to take down all the banners and awnings, and the air was getting bad. Friday was bad, but it got worse Saturday, and even worst Sunday — where the head/cross wind was 40mph. To make a long story short — I declared for the 9.75 index and qualified 6th of the 12 racers entered in the NSS Class. Dallas did better with a #3 Qualifying. I was chopping down the tree in Qualifying with a .014, -.011, and .020 lights. Dallas and I both won our first rounds, as did Duell, Camp, Sanders, and Stansbury. The bad news was Dallas and I were on the bad side of the ladder and had to meet each other in the next round. I had both cars tuned (with weight using the Chew Chief 7 Predictor) to dead on, so that we would leave it to our lights. Dallas had also been having good lights. However, I screwed up and went -.008 red at the same time Dallas was napping a little. Father and son show down. Father goes .008 Red! The other winners were Duell, who would get the bye in the next round; and Camp — who’d go up against Dallas. Dallas had a better light than Barry — but took too much of the stripe in a Double-breakout — putting Barry in the finals against Doug. Doug won the event in a close race. I’d like to take a minute to thank Randy at Royal Purple, Sam at TTI Exhaust, and Don at Crew Chief for sponsoring us with their best of class products — and promise them we’ll do better in Atlanta. 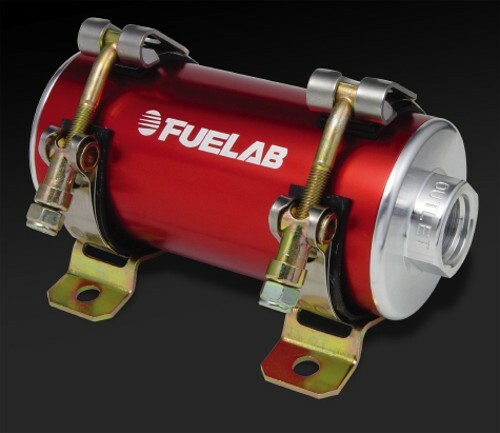 I’d also like to thank new sponsor Brian at Fuelabs; for sponsoring us with the the fuels pumps, filters and regulators that champions like Doug Duell and Andy Warren have on their cars. Dave and Dallas Schultz traveled to the PRI Show at the Orlando Convention center earlier in this week. At the show they looked at parts and equipment to enhance their racing, speak with some current and potential product sponsors (hopefully some news to announce in the next couple of weeks with regards to a couple of new product sponsors) and attend the NMCA Awards Ceremony — where Dave received his fifth in a row Top 10 Jacket (he missed the Championship by 1 round this year) and Dallas his 4th in five years (he took a year off a few years back). A very big and pleasant surprise to Dave was that NMCA Drag Racers voted him as the 2012 Ambassador of the Year, and he received the above pictured award. Last year Dallas had received the Crew Member of the Year — as voted by the NMCA racers. Both awards are very much coveted, and as important to the drivers as a Wally — as they only receive them through the votes of the others who race in NMCA. Dave Schultz driving the Texas Whale won his first ever NHRA Wally at the Lonestar Shootout this past Sunday. It was a very pleasant experience after the disappointment of losing the 2012 NMCA Points Championship in Nostalgia Super Stock by less than one round, just a couple of weeks earlier in Indy. It was doubly satisfying that his wife and youngest daughter were at the track to witness Dave being able to cross "Winning a Wally" off the top of his "Bucket List". The event started by loading up the rig with Big Red Ram and the Texas Whale on Thursday and leaving for the track early Friday. Friday was Time Trials, and that went well with Dallas able to run 9.2s for his 9.50 Index, and Dave 9.5s for his 9.75 Index. With rain coming in for the weekend, they knew they'd like to have a tenth and half in the bag for Sunday. Saturday both Dallas and Dave went a little too fast for the first round of qualifying. 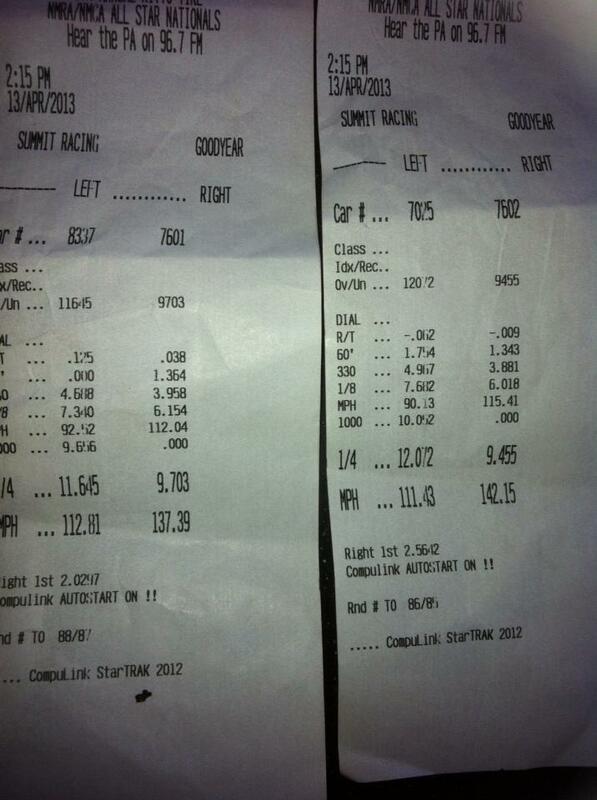 The second had both getting Conservative with the weight and tune, with Dallas running a 9.54 and Dave a 9.77. Neither were able to improve for the third and last round of qualifying — and so Dallas was the #5 Qualifier, and Dave was #3 (of ten cars qualified). First round Dave lined up against Doug Watkins in his beautiful Blue Chevelle running the 10.0 Index. Doug had Dave on the tree and hit the brakes between the MPH cone and the finish line for a 10.06 on a 10.0 index — but Dave lifted to put a 1/2 fender on Doug for a 9.750 on his 9.75 index. Time Slip below. In the 2nd round Dave had to take out the same guy (Steve Stahlschmidt) who had taken out Dallas in the first round. There was Vengeance in Dave's heart. Dallas was .005 better on the tree — but he may have gave Steve about 2' too much stripe (very easy to do when your car is 1.5 seconds faster) and so he broke out with a 9.479 on a 9.5 Index — against a 11.011 on a 11.0 index. It was a very close race that could have gone either way. For the second round Steve Red lit against Dave — but Dave says he would have had him covered at the stripe. Dave ran the car out for a 9.73 @ 140MPH so he could see where he was going to be at for the next round. In the 3rd round Dave had Tony Smith — who owns a race chassis shop and had won the Lonestar Shootout last year. Tony was the Top Qualifier, so he earned a Bye in the previous round. He is also deadly on the tree. Strangely enough — Dave had also ran Tony in the Semis at Dallas and had won at the Stripe. Tony pressed the light and red lit — but again Dave feels he would have had him covered at the stripe. The weather had turned bad, and Dave was one of the few cars running that still had plenty of weight to take out to run his number. Pit Crew7 told Dave that Tony should have been 9.9' ahead of him at the MPH cone — and if Tony had been more, Dave says he would have let him take the stripe and breakout. Dave again ran it out for a 9.73, to remind the drivers that they'd better press the light as he had enough car. He will usually weigh the car down to keep .02-.03 of a second in the bag for the stripe. The final round was Randy Stansbury — the guy Dave had beat in the finals at Dallas back in April. Randy was the 2nd qualifier and won the coin flip to put Dave in the Right lane. Dave had been a little slower in the right lane — and he likes to put the slower car in the right lane so they can't look over their right shoulder to see him coming. It usually scares Hell out of them when he passes. Randy had had a Bye in the Semis. Lots of drama in the finals. Dave assumed his Crew Chief (DALLAS!) had turned off his fan and water pump after the last round — and Dallas assumed he did. While the motor was cool — Dave didn't have near a full charge (16V system without an alternator) and so he didn't do much starting to move up in the staging lanes. When under the tower — he started the car to let it car warm to 150 degrees. Dave likes to do his burnout at 150, stage at 165, and finish at 190 degrees. Just as they were to pull in the water box — the ProMod that went before them blew up (in Dave's lane), caught fire and went into the sand traps. It took 45 minutes to get all of that squared away. Dave shut the car off as soon as he saw it happen — and turned off his water pump and fan. He'd turned it on a couple of times to cycle the hot water out of the block. About 30 minutes into the wait — Dave saw the American flag was limp after having a 10-15 MPH tailwind all weekend — so he had Dallas pull another 10 pounds out of the weight box. When told to start up — Dave's car went Click-click. He had 14 Volts on the gauge. He tried once again and it went Click-Click and then started. Dave had a much better light than Randy and passed him about 200' before he should have — and so he hit the brakes for a 9.85 at 121 MPH. Randy wasn't able to get his car to run the number with the weather deteriorating, and was a tenth too slow. When Dave got to the Winner's Circle the car died and had to be towed back. It took an hour at 25AMPs to get it started to put in the trailer. 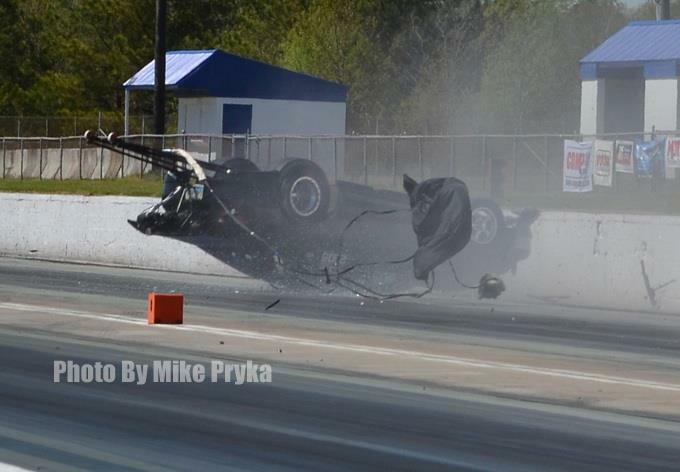 This was the last race of the year for the MoparStyle Racing Team. For Dave, it was a happy ending after a disappointing close loss of the 2012 Championship in Nostalgia Super Stock at Indy. The engine in the Whale is about to come out, and a new one stabbed in before taking it to Indiana for new custom headers and chassis work. Last year we threw $40,000 at the Big Red Ram — and it is good to go after some end of year freshening up. We'd like to thank all of our sponsors (see the sponsor page on the car's sites), and hope we can count on their support again next year. We were especially proud to win a Wally and the track of our sponsor Royal Purple. Next year Dallas and Dave will not be satisfied with anything less than #1 and #2!